The Zine Yearbook #1 contains a representative collection of reprints from zines published in 2007 and also a pulse of what 2007 was like for zines! 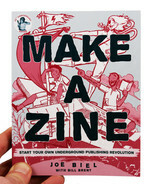 It also includes relevant articles about the year in zines - super fun zine fests, life changing experiences, amazing pen pal connections, and stories from people who hold zines dear to their hearts. 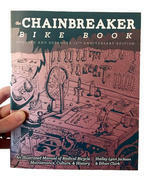 It's twice the size of previous zine yearbooks with mostly preserved original layouts! "Microcosm’s treatment of the Zine Yearbook project is nothing short of inspiring – both in terms of process and product. The thousands of zines read and mulled over at meetings lead to 230 pages of over 120 selections from various zines. The final product is a tasty sampler containing thoughtful, engaging, personal, independent writing and artistry from around the globe. Accompanying each printed submission is the contact information for your follow up – write them and tell them what you think, order the zine for yourself, or tell us local librarians how much you loved a certain entry and wish we had it available for checkout here. …the whimsical art and text of “My Friends and Their Tall Bikes,” the great storytelling in Pensacola’s “Mylxine” zine, the illustrations from “Bowling Stars of 1989,” the funny and interesting responses from the ad posting’s of the author of “Three Minute Girlfriend.” All a must-see!" 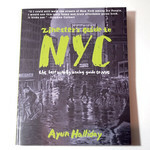 I'm hoping a Zine Yearbook will be published in 2010 (I figure publishing a ZY in 2009 is unlikely as 2009 is almost over). If a Zine Yearbook is published in 2010 I think it would be good if it reprinted material that was published in zines of 2008 AND 2009. I have a copy of Zine Yearbook #9 (bought from Microcosm) and I enjoy it greatly. "The Zine Yearbook is assembled once a year by a rotating team of editors who basically cull snippets from hundreds of zines they get each year, compiling the best bits into a book. This year some of the folks at Microcosm were in charge of getting everything together and it’s, for the most part, a pretty entertaining array of material ... Some familiar ones like Avow, Invincible Summer, Doris, and Duplex Planet show up, but it’s the niche ones I’d never heard of (like QSL USA, Next Stop Adventure, Papercutter, and There Is a Danger) that piqued my interest . I enjoyed the Tom Gabel (Against Me!... whom I dislike) in Coffeebreath where he talks about living in hotels for a year and the history of anarchist mathematicians in One Way Ticket especially. The zine yearbook, I guess, serves as both a decent introduction to hundreds of zines that people may not have heard of, as well as a celebration of the ones that apparently thrilled the editors to no end..."
"What is not to love here. 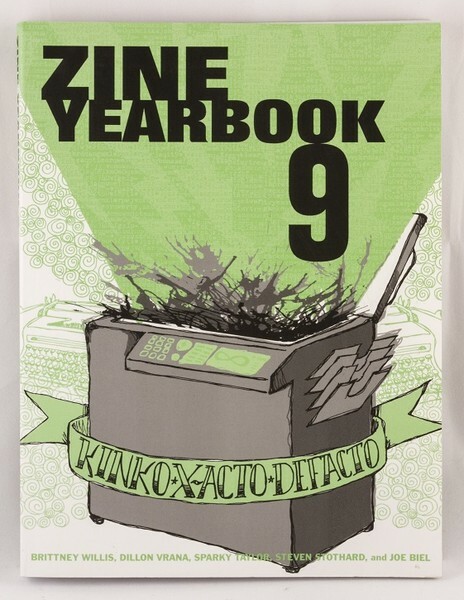 This is the 9th annual Zine yearbook. I don't think Microcosm published the previous eight years, but they are here now. This is sort of a Reader's Digest for zine culture. Instead of talking about zines you get excerpts from zines from all over the world all compiled together. 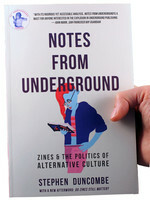 If you have been wondering lately if the zine culture can survive along side the Internet, this volume seems to give the affirmative thumbs up. 240 pages must be telling the truth. 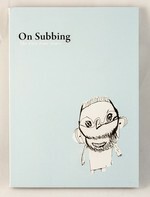 The content draws from personal zines, comics, political zines to profiles on famous mathematicians. 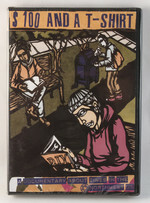 If zine culture covers it, it is featured in this volume. 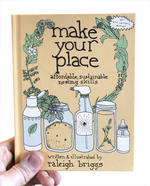 Each item includes contact information for the author if you want to check out the original source. Of course because it draws from so many sources, the content is a bit uneven here, but I am sure that something here is of interest to you." It looks gorgeous, guys. Thanks for including me. Thank you for taking on this Herculean task! Thanks to your efforts, I've got back of the toilet reading through 2009! WOAH!!! ME SO EXCITED FOR ZINE YEARBOOK #9!!! I am glad to see that the Zine yearbook is still around! + They acknowledged the potential weaknesses, e.g. zines' power weakened by their appearance in a book. + Transparency of operations (publishing costs/expected earnings breakdown). + I like that they credited the authors in opposite alphabetical order. + I appreciate their copyright statement, "All content owned by original authors and artists." + They seemed attentive to achieving gender, race, and class inclusiveness. + Nice flow from one zine to another, good groupings. They made it easier to read than many anthologies of diverse content. + You get the feeling that the editors really thought about what people's concerns would be ahead of time and tried to prevent them. + Good value for its price. 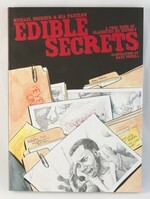 Originally $12 and now listed at $10, that's a fair price for a 240 page book put out by a small small press.